To practice the principle, means that I understand that there is a principle I can use to make my life a treasurable and happy journey. 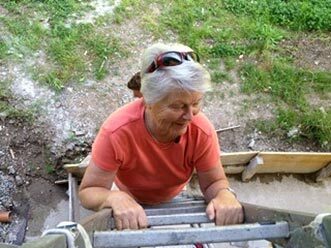 Ellen climbing to the top of her family's Lugano penthouse. Living away from the UNI-campus, an environment of meditation and seclusion, gives me the opportunity to listen to my inner self, epitomizing truth. There is only ONE truth, one god, one absolute, one allness; one IS—unlimited to any relative appearance. To live this truth by principle means that I am selfdisciplined and selfdetermined in my thoughts focused on reality. For the fun of life, I have created a little aide-mémoire I keep with me on my trips around the world. 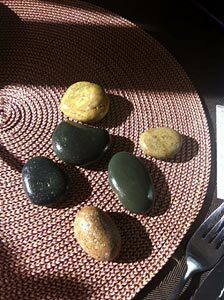 A special stone from the UNI-campus, polished with love and light, is my retelling token I carry with me wherever I go. 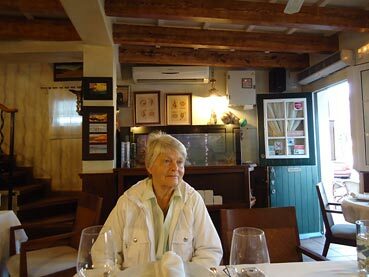 Ellen delights in the cuisine of elegant and casual restaurants worldwide. Always a master and gourmet with exquisite taste. 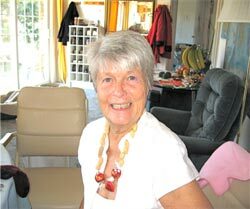 Arriving at the beginning of May in Switzerland and living with my daughter Mariella, her husband, their five children—my grand children—their friends and relatives, I sometimes get to hear dialogs—not always reflecting my habitual pure life style. Their astounding reports on their studies, their works and their sports adventures are for me an ever so blissful opportunity to silently set new refreshing causes into motion. So, Melissa, sweet sixteen, my youngest granddaughter—a number one tennis star—one evening discovered my treasured stones lying on my night table. With a charming yet inquisitive look she wants to know what these stones serve for. I explained to her that my stone is always close to me to remind me that ALL IS IN DIVINE ORDER in my life. Whatever the appearance might shine forth, I hold strong on my stone and speak my powerful affirmative words. It does not take long that Melissa too caries her stone in her pocket using it especially during her tennis matches and at school when facing interrogations. Honored like a newly crowned princess Melissa shows off her stone to her elder sister Micaela, another great tennis star. Little by little each family member is blessed with a campus “diamond”—an ideal reminder of keeping positive in thoughts. IT WORKS, it silently twinkles from my heart and they all accept. For some time I had little contact with my one and only sister living in Germany. In order to visit her I had prepared for her a special precious golden box wherein I nestled one of my stones. I filled the tiny empty corners with unconditional love and proudly presented my gift to her on my visit. Inquisitively she opens the box gratefully accepting my present as a token of inner strength. Harmony in my family, harmony in and around me is one of the greatest presents I enjoy in this lifetime. It just happened on this very special trip to Europe that once again we shared our life stories with an open and happy heart and the past was gone forever. My every morning affirmations on a peaceful meeting with my sister manifested and are splendidly done! Menorca is one of the four islands in the Spanish Balearic archipelago located in the western part of the Mediterranean Sea. It is the second largest island of the four, drawing its name from its smaller size in comparison to neighboring Mallorca (Majorca). Here on this heavenly island my daughter and her family own a most charming vacation home. Every room of the house enjoys a glorious view on the ocean framed in a green botanical landscape. 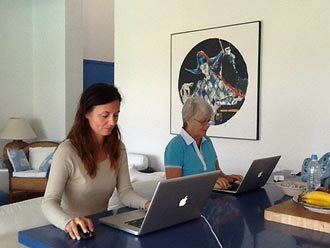 Manuela and ever-diligent UNI CEO Ellen busily working at their computers on the paradise isle of Menorca. Peace radiates from this paradise-island where I am offered the most relaxing meditative days in company of my daughter Mariella and for a few days her friend Manuela. Menorca has a large number of small, interesting shops with a wide range of souvenirs stores, which invited us to stroll around and explore. The artistic traditional footwear of the inhabitants of the island, the espadrilles, fascinated me. The comfortable flat soles sandals are made of used tire rubber and are available in the most beautiful colors. Markets in Menorca provide the ideal place to purchase some of the freshest food especially fresh and delicious fish from the ocean. I delighted to get an in-taste of it in different fine restaurants and of course cooked by my personal master chef, daughter Mariella. Ten days went too fast as the island is an ideal place for meditation and for being myself and have fun. My campus stone is my close companion and smile from within my heart always reminding me to live according to principle, to focus on reality. Thank you my beloved family for offering me such a fulfilled journey. 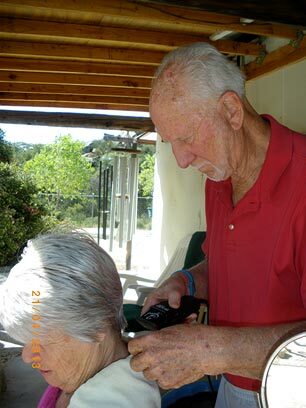 Herb gives Ellen a haircut. 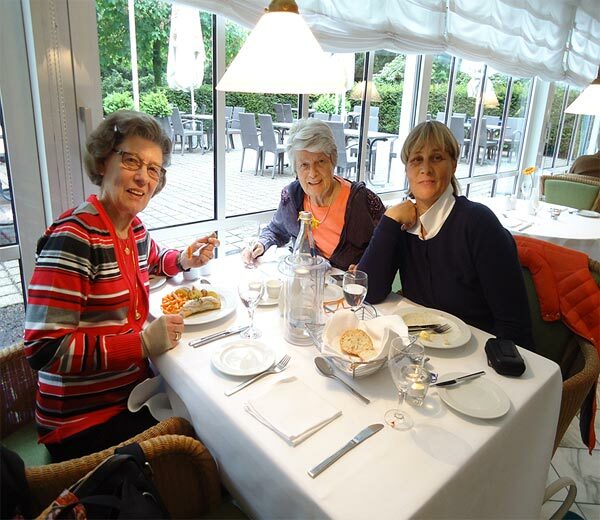 Ellen's sister Marlis, Ellen, and daughter Mariella in Germany.